Accentuate the beauty of your property with StyleLine Windows & Doors from Total Window Repairs. Total Window Repairs have been a proud supplier of fantastic double glazing products for customers throughout Blandford Forum, Shaftesbury, Gillingham and Weymouth since 2001. Our belief in bringing the best products to each and every customer leads us to proudly present the StyleLine windows & doors range of double glazing products. One of the many fantastic products available from home improvement giant Sternfenster, the StyleLine windows & doors range is an amazing way to properly accentuate the existing beauty of your home, with seamless finishing and all the benefits of contemporary uPVC construction. Complete your home in style with StyleLine. By utilising the latest in uPVC construction technology, we are able to provide you with some of the most durable and impressive windows and doors on the UK home improvement market. With StyleLine windows & doors that boast seamless finishing between the sash and outer frame, you’ll easily notice the benefits of your new double glazing products. Sternfenster products are fantastically unique in that they are constructed from a state of the art Seamless Quad Welder from Graf Synergy, allowing for the construction of unbelievably high-quality products. Total Window Repairs are proud to install products that have been crafted by a top of the range manufacturing process that brings aesthetics and quality to the table. StyleLine windows & doors are also fantastically thermally efficient, and are specifically imbued with intense weather-proofing techniques during the manufacturing process to ascertain that they will protect your home for years to come. As a standard, the StyleLine windows & doors range qualifies as an A grade product range on the Window Energy Rating scale. This amazing grade can be improved however, as we offer a host of customisation options for you to tailor your products to your own needs. 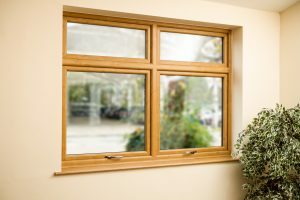 If you want maximum thermal efficiency then we recommend opting for triple glazing, building upon the vacuum seal technology inherent in double glazing and going one step further. Your home will be warm all year around! This energy efficiency also has the added benefit of providing a product that will continue to benefit you long after installation. Once your StyleLine windows & doors have been efficiently installed, you will begin to notice reduced energy costs in your home as you no longer find the need to continue heating your home to ward off the cold British winters. We are proud to proclaim that all StyleLine windows & doors are properly compliant with the British Standard Kitemark, complying with and surpassing all British construction regulations. Furthermore, they are guaranteed to offer you maximum security due to a number of intricate hardware constructs built into the profile that are specifically designed to endure and protect. This high level of security is earned through the introduction of incredibly durable steel reinforced frames, which are welded with the latest techniques to ascertain absolute rigidity. We then install intricate interlocking mechanisms in our StyleLine windows & doors that coalesce with internal beading and multi-point shootbolt lock points in tandem with additional security claw locks. All of this results in one of the safest product lines on the UK market, and when you purchase StyleLine windows & doors you are purchasing some of the most secure products in the business. This devotion to security has been officially endorsed by the UK Secured by Design initiative, complying with European security standards BS7950 and PAS24. StyleLine windows & doors are the perfect way to properly complement any property, so if you want to get a bespoke price that’s tailored to your exact requirements then give our team a ring by calling 01747 812 666 today. We’ll happily help you explore your options and locate the product that’s perfect for you. On the other hand if you prefer to contact us in writing then you are more than welcome to fill out our online contact form. Our team will get back to you as soon as possible to answer any queries you may have about our products and services. You can also check out our online quotation engine for a quick and specific quote. Revolutionary machinery allows our StyleLine range to bypass the unsightly grooved corners that most PVC products have from the corner cleaning stage. The pioneering manufacturing process means that the StyleLine range of windows effectively replicate the look of traditional wooden joinery. Compliant with British Standard Kitemark and PAS 24 standards for security, and the Association of Chief Police Officers Secured by Design standards with optional laminated glass. A tilt and lift facility for simple cleaning options. Equal sightlines on both our top and bottom sashes. Optional decorative horns and astragal Georgian bars. An option of Cream, White, Irish Oak, Light Oak and Rosewood laminated foils. A choice of finishes and optional extras to help you achieve a custom look. Period hardware available in either Chrome, White or Gold.